Take a flick // Gathering all together, journalism students take a selfie with Allie Spillyards before she daparts. Students got up close and personal with the NBC News reporter, and got a chance to dive deep into her world of journalism. On Wylie Way Day, Feb. 6, journalism adviser Casi Thedford invited one of her former newspaper students to speak to her first, second and third period journalism classes about her professional career in the field of mass communications. 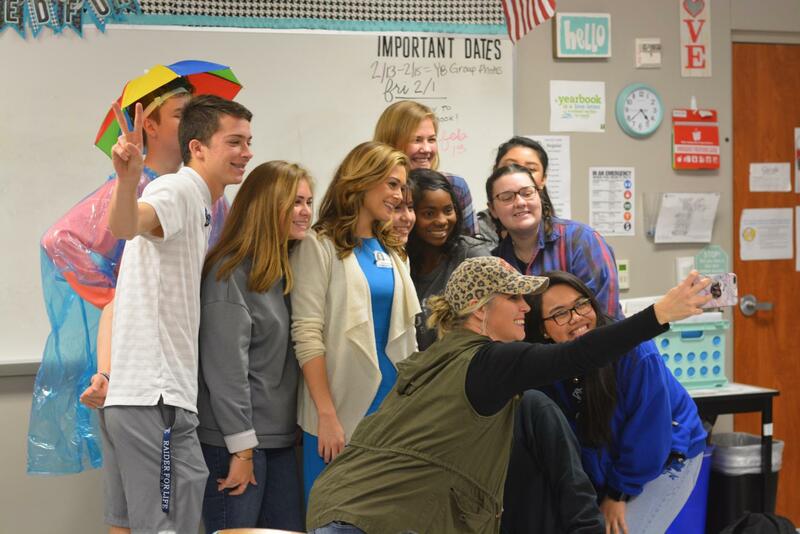 Allie Spillyards, NBC 5 DFW reporter, showed students her video news stories while working as a reporter and answered students’ questions on the difficulties in the field of journalism. The students got a chance to see the professional side of journalism and what it takes to be successful. Spillyards showed the aspiring journalists her video news stories, some heartfelt and some exciting. Her different stories ranged from toilet malfunctions to deaths in family. In her discussion, Spillyards explained how she moved around in the field facing different experiences and challenges along the way. The students got a chance to ask several questions along the lines of safety and public backlash of the media. Spillyards explained that it will happen in journalism but that comes with the job. “It was a really cool experience because we got a chance to meet somebody who is a part of the industry we desire to be in,” said sophomore Audrey Wentz.